Lee (left) is being briefed by Bomba Zone 6 chief Law Poh Kiong during a visit to the affected area in Kuala Baram today. MIRI: The authorities may consider using drones to catch the culprits who are carrying out open burning here. 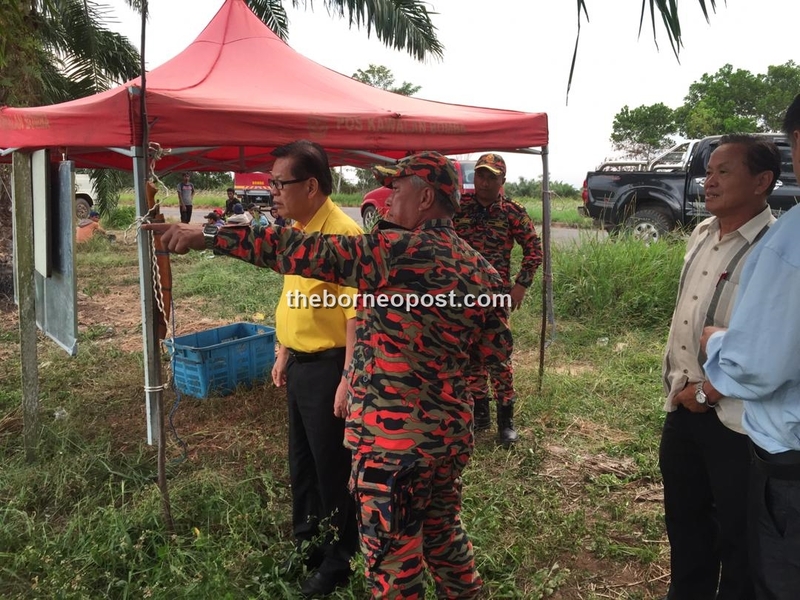 Senadin assemblyman Datuk Lee Kim Shin when contacted today, said he had asked the Department of Environment (DoE) and Natural Resources And Environment Board (NREB) to consider using drones to identify individuals who are conducting open burning. “Just because of a few irresponsible individuals carrying out open burning especially during dry season, everyone here has to suffer because of the haze,” he said. It is estimated that over 100,000 of the residents in Senadin, Tudan and Permyjaya were affected due to the open burning here. Lee stressed that the culprits must be caught and punished as a deterrent to others so that the people here will not have to experience air pollution in years to come. “There were two cases where the culprits have been caught red-handed. But there are a few more that have yet to be arrested because of lack of evidence. “They have to be caught in the act. That is why I suggest the enforcement to use drones,” he said. The city was blanketed in thick smoke on Monday, causing the Air Pollutant Index (API) to reach unhealthy levels at 103 yesterday morning. However, the situation has improved since yesterday afternoon with the API readings at moderate levels, thanks to the over 60 personnel from Zone 6 Fire and Rescue station (Bomba) and volunteers who have been working round the clock to contain the forest and peat soil fire in Kuala Baram and behind SK Kuala Baram II since Monday.